Successfully saved Vegan Cinnamon Coffee Chocolate Chip Muffins to your Calendar. You can also save the ingredients to your Grocery List. 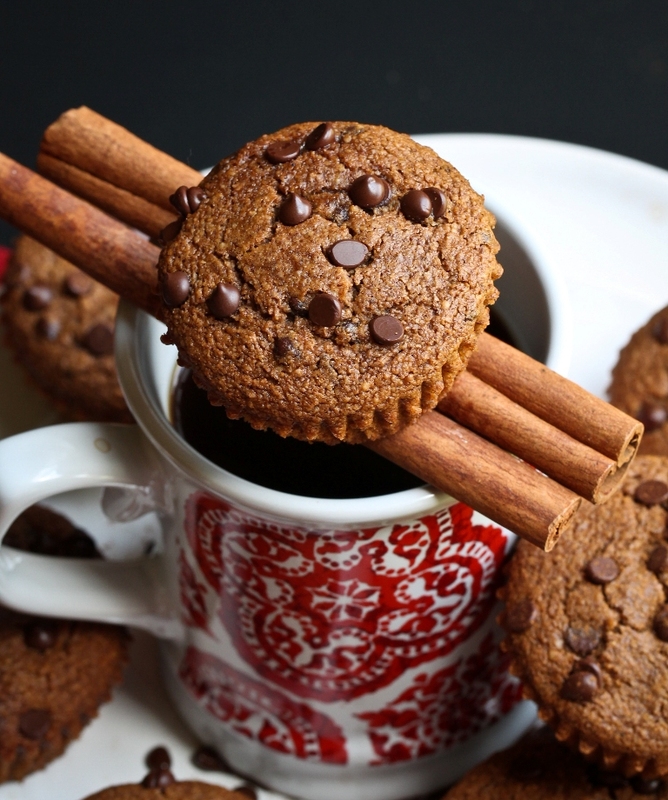 Vegan Gluten-Free Cinnamon Coffee Chocolate Chip Muffins are SO RICH in flavor and incredibly moist with the most delicious, robust flavor. These muffins are just 8 ingredients, dairy-free, oil-free and ready in 30 minutes! Note: I always recommend a scale for baking for complete accurate results, as we all measure with cups differently. This will help prevent fails. I have used this scale for years and love it! For the almond flour, make sure to use a superfine one or the muffins will be more gritty/dense and verging on too moist. I recommend King Arthur, Honeyville, Wellbees or the HEB brands. Bob's Red mill does not yield a fluffy muffin, but more wet/dense. 1 1/4 cups (140g) superfine blanched almond flour (see NOTE) 1/2 cup + 2 tablespoons (80g) superfine oat flour 1/4 cup (32g) tapioca starch (I use Bob's Red Mill ) 1 tablespoon + 1 teaspoon quality strong cinnamon (I use Saigon , don't use a bland cinnamon!) 1/2 to 3/4 cup (96g-144g) coconut sugar (depending on how sweet you want them, note that using coffee makes things more bitter so if using the coffee I always use 3/4 cup) 2 teaspoons baking powder 1/2 teaspoon fine sea salt 1/4 cup + 2 tablespoons (90g) dairy-free semi-sweet chocolate chips (I use Enjoy Life brand) 3/4 cup (180g) strong brewed coffee that has been COOLED (the stronger it is, the stronger the muffins, sub with a light plant-based milk such as almond or rice milk if you don't want to use coffee and add a teaspoon of vanilla extract) Note: I always recommend a scale for baking for complete accurate results, as we all measure with cups differently. This will help prevent fails. I have used this scale for years and love it! For the almond flour, make sure to use a superfine one or the muffins will be more gritty/dense and verging on too moist. I recommend King Arthur, Honeyville, Wellbees or the HEB brands. Bob's Red mill does not yield a fluffy muffin, but more wet/dense.